Sree Gokaraju Gangaraju is an industrialist. He established the “Chemiloids”, a company manufacturing aayurvedic medicines, and also some sugar factories, “Ashram” Medical College of Eluru, “Sri Gokaraju Gangaraju Engineering College” of Hyderabad, colleges of Pharmacy (for M.Pharm.) and Computer Applications (for M.C.A. ), and has been giving employment to many in the fields of education and industry. With a view to serve society at large, apart from donating his lands for many aasrams and organisations, he has been rendering his services as Trustee or Chairman also for some of them. 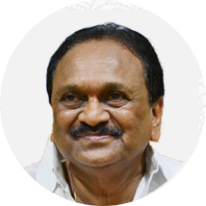 He has liberally donated lands for the JET – Jeer Educational Trust established by China Jeer Swamy, the ISKCON temple constructed on the banks of Krishna River in Vijayawada, the Art of Living ashram, the Pyramid Dhyaana Kaendram, and the Aqua Devils Association.Sree Gokaraju Gangaraju is the inspiration for establishment of the ”Dr. Manthena Satyanarayana Raju Trust “. He has not only donated the land for constructing the Aarogyaalayam, but also signed as guarantor for Bank loans taken by the Trust for this purpose, and he also insisted that the aasram should be named after Dr. Satyanarayana Raju and should not be in his name. These actions of his show his commitment to serve the society in all different ways possible.His services in prodding and guiding Dr. Manthena Satyanarayana Raju to take up the aasram venture and ensuring smooth running of the Aarogyaalayam are excellent.